The 2010 Consumer Electronics Show was all about "3D" Televisions for the home. Let's be clear: There's nothing "3D" about these displays. They are stereoscopic. Much as stereoscopes completely replaced traditional albums of photographs in the 1850's... oh wait. Here in the twenty-first century, most people still keep albums of traditional photographs. 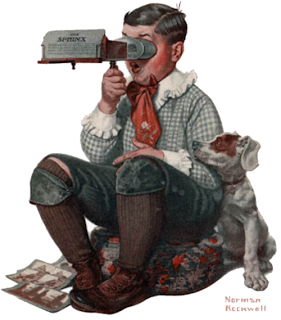 Could stereoscopic photography be anything more than a fad? I loved my ViewMaster back in the 1970's and in the 1980's one could purchase stereoscopic film cameras. In 2010, we'll see a bunch of stereoscopic digital cameras. Most homes just upgraded to digital TV at a price point the average consumer wouldn't have considered a decade ago. There is no way they can justify a new set. Stereoscopic programming cannot be viewed while lying on the couch or in bed. The headaches caused by some of the viewing technology. No programs. While there are a handful of movies that were shot in stereo, but most new programs will just be re-renders of digitally animated movies. Did you really love "Avatar" enough to plunk down another two grand for a new TV, buy a new "3D" Blu-ray player, and sit perfectly upright wearing dorky glasses just so you can watch it at home? But Gaming is whole other issue. Gamers are used to strapping on a headset, so adding the glasses would not be a big deal. We're used to sitting perfectly centered in front of a screen for hours at a time. I think stereoscopic monitors for gaming could become standard gear. But I think you get a much more compelling 3D experience with something like this head-tracking demo.